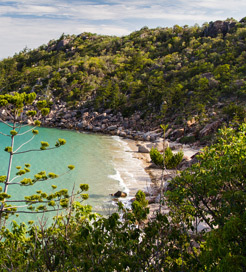 Nestling just 8km off Townsville’s coast in Queensland, Magnetic Island is a small tropical getaway boasting over 320 sunny days a year. Affectionately known as ‘Maggie’, the island offers stunning coastal walks, peaceful beaches and great fishing opportunities. Some of the species around the island include blue marlin, mahi-mahi, tuna, red emperor and sailfish. Over half the island is a National Park, so naturally there is an abundance of wildlife. It is home to over 800 koalas, many types of bird and the rare wild rock wallaby. With around 2,500 local residents, the island has everything you might need such as shops, a post office and a comprehensive bus network. Be sure to stop off at Arcadia Village on the east coast. It has supermarkets, restaurants, bottle shops along with a range of accommodation to suit any budget. During the day you can enjoy scenic walks along one of the 23 bays and beaches. At around 5pm you’re likely to come across adorable rock wallabies along Geoffrey Bay, as this is when they come out to feed. A popular walking route takes you along the World War II forts. Townsville was established as an important military base in 1942 and Magnetic Island’s vantage points were used to spot enemy aircraft. The forts walk usually lasts around 1.5 hours so make sure you bring plenty of water. If sunbathing is more your style then Horseshoe Bay is the place to be. It’s the prettiest beach on the island where you’ll find a range of water-sports, a stinger enclosure and the chance to cuddle koalas in the nearby Bungalow Bay koala sanctuary. There is also a delightful beachfront crafts market every month. Some important dates on Maggie’s calendar include the Great Tropical Jazz party in August, Magnetic Island Adventurethon in March and the monthly Full Moon Party. The Bay Days Festival from September to October is a must, offering a variety of events ranging from the ‘Beer Can Regatta’ to ‘Shakespeare under the Stars’. Getting to Magnetic Island by ferry is simple. It’s only 25 minutes from Townsville and there are 17 journeys a day from the Breakwater Terminal arriving at Nelly Bay on the island’s south east coast. Sealink Queensland provide three high speed catamarans, all equipped with bars, air-conditioning and sun decks. For more information, please visit our Ferries from Australia to Magnetic Island page.